After being removed from Venezuela and then invited back, CNN has deployed Christiane Amanpour to give a softball interview to Nicolás Maduro. The Venezuelan leader told Amanpour today that unemployment is decreasing and he hopes the United States would “respect” his country. Maduro began the interview with an open lie: “CNN is always welcome to Venezuela,” he told Amanpour less than a month after kicking CNN out. It didn’t get much more honest from there. 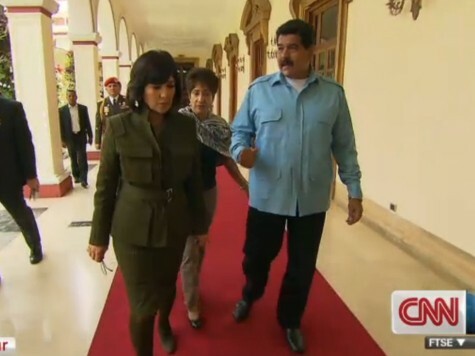 Maduro told Amanpour that the economic problems of his country were due to “capitalism” and the “economic war” the United States is staging against Venezuela. 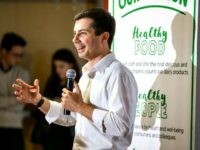 He asserted that his country had public education: “In the United States, did you have a public education for the children or the youth in the US? No,” he lied. He also took issue with Amanpour claiming that Venezuelan relations with the United States were “very bad”: “Our relations with the US are very good,” he told her. Maduro expelled three diplomats last month for the usual “economic war” and “fomenting violence” reasons. As for the protesters, they are all “right-wing extremists” calling for a “coup.” He asked Amanpour rhetorically, “What would the US do if a tiny group would say they’re going to generate a revolution or a revolt to change the constitutional government of the US?” He implied that President Obama would use force against an opposition like the Tea Party. At least 19 people have been killed since Maduro’s National Guard began to oppress the unarmed student protesters flooding the streets of his country, and at least 300 have been injured. Upwards of 1,200 protesters have been arrested. Videos of students beaten with metal helmets and sticks and shot at with guns have become the order of the day in a country with one of the highest murder rates in the world. Maduro is the latest in a string of state leaders accused of horrendous human rights violations that have sat down with Christiane Amanpour. The journalist can count among her interviewees characters as wide-ranging as Bashar al-Assad, Muammar Qaddafi, Robert Mugabe, Mahmoud Ahmadinejad, Dmitry Medvedev, and Mikhail Gorbachev.